A couple of weekends ago my talented friend Elizabeth, Houston florist at The Petaler, and I got to hang out at Lovely Bride in Houston, Texas and witness brides from all over the world come in and try on gowns. There were people coming in who lived in Houston, looking for their perfect wedding dress for a local Houston wedding venue. There were brides looking for their dress for their destination weddings (lots of Texas Hill Country weddings & Austin weddings). And last but not least, there were brides from afar who flew into Houston specifically to wedding dress shop. One bride was even from Dubai! Elizabeth and I got to witness strangers going through the process of finding THE dress, which was quite exciting. From the time that these brides and their entourages are welcomed into the store, the expert stylists’ know exactly what it takes to make their experience simple yet memorable, engaging, and unique. They’re so knowledgeable about all of their designers & dress styles, and it was so special to see how they worked with a bride and her family once she was in front of the tri-fold mirror in what could be the dress she walked down the aisle in. My favorite part of the process, though, was definitely when a bride was evidently leaning toward a specific dress while she was in front of the mirror. At that point, Elizabeth would unobtrusively walk up to the mirror with one of her work-of-art bouquets and simply hand it to the bride. And I kid you not, the room falls absolutely silent after a collective gasp from the stylist, the bride, the brides entourage, and Elizabeth & I. That bouquet just sold the dress. Individually, they each hold such beauty, but when you mix a killer, well-made bouquet with a designer gown, magic can happen. Even with how much of an impact those moments had on me, we must have experienced this like, 15 times that weekend and I can honestly say it was just as special every single time. I had goosebumps like it was my job! 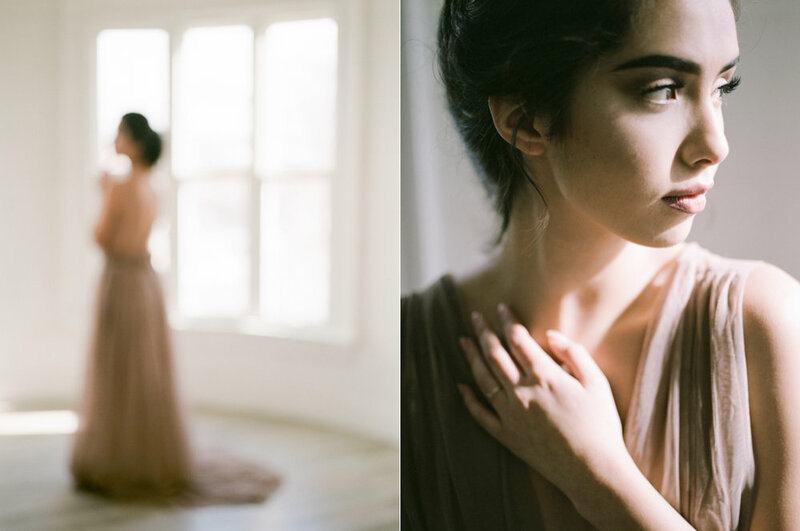 I had the pleasure of photographing Emily in 3 of her favorite gowns. The favorites were a two piece stunner made of a long sleeved Alexandra Grecco dress + Tara Lauren skirt, a sleeveless lace Marchesa dress, and a romantic Carol Hannah gown. They were all so beautiful & unique, and it was such an absolute pleasure to work with the Lovely Bride team. I can’t wait for the next weekend that I get to witness more brides saying yes to the dress! I just love the Salt Lake City, Utah wedding industry. I feel like the creativity is through the roof and it's teeming with talent. 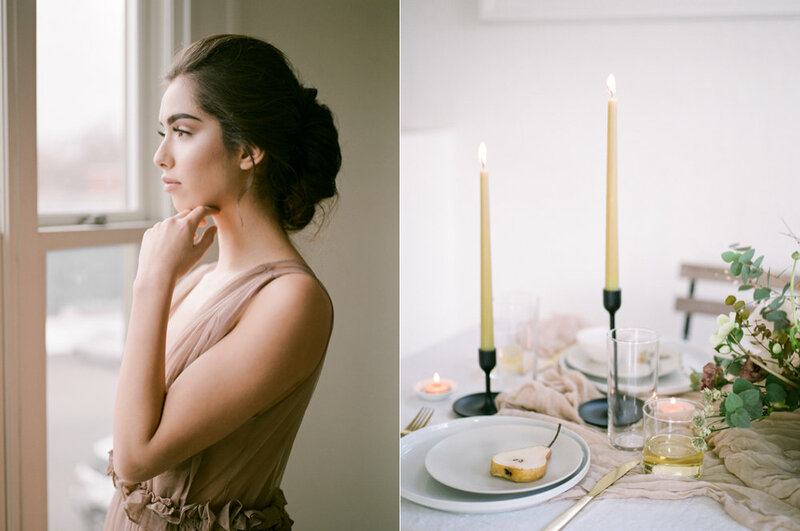 I'm so on board with the modern minimalist spin with still keeping things inspired by classic weddings. When I knew I would be traveling to Utah from Texas for a destination wedding workshop, I knew I wanted to work with someone who was on board with my ideas and had a similar aesthetic to my own. I also knew it's a bit tedious to plan a shoot from afar, so the less cooks in the kitchen, the better. This meant someone multi-talented who could style and provide florals was a must. Lexi Sandberg from Carpe Diem Design was the perfect lady for the job, and knocked this one out of the park! This bridal session with Jacqueline took place in a studio space in Salt Lake and we knew we wanted to utilize new shooting techniques, have a modern approach to classic weddings, and use negative space wisely within our shots. I also made it a priority to experiment with motion and shoot a few double exposures. 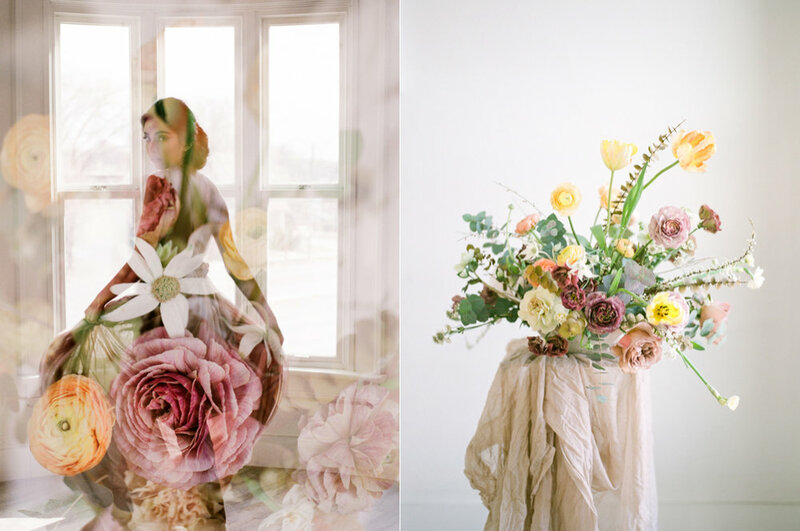 Our fabulous team wanted to portray a creative, spring inspired editorial without being stereotypically pastel. 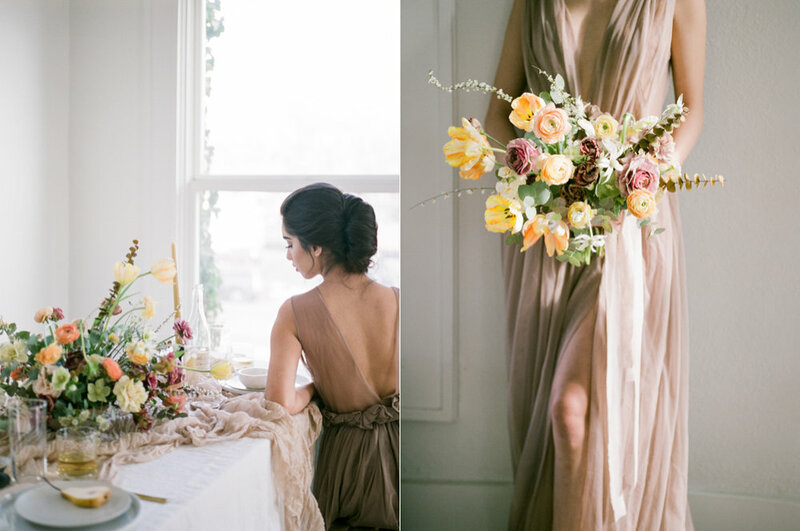 Our colour palette consisted of mauve & mustard with complementing neutrals. The flowing deep v-neck gown from Adorned Rentals provided the motion aspect we wanted in the shoot. It moved so effortlessly, and was perfectly understated. I feel that a wedding gown like this one would be perfect for the minimalist bride who still wants a little bit of frill to her wedding dress. 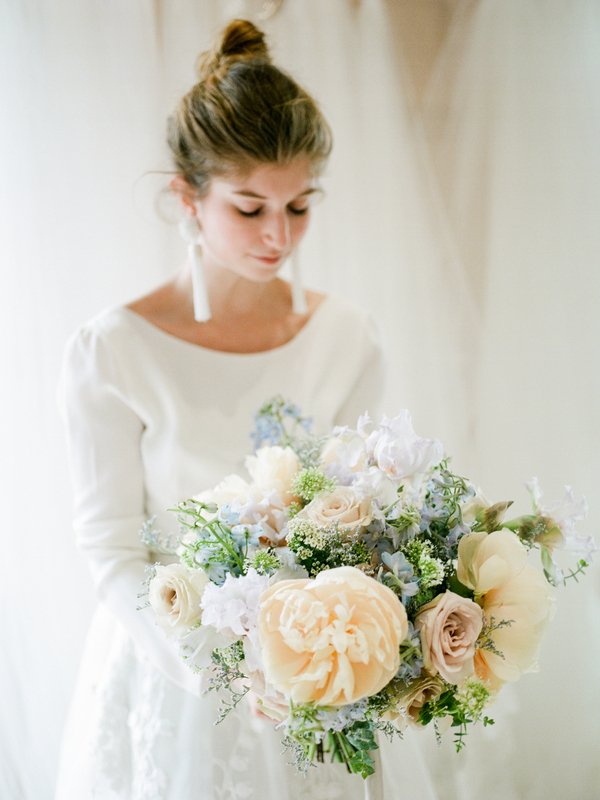 The stunning florals by Carpe Diem Design brought the spring element with their incorporation of blooming branches and a fresh yet muted colour palette. 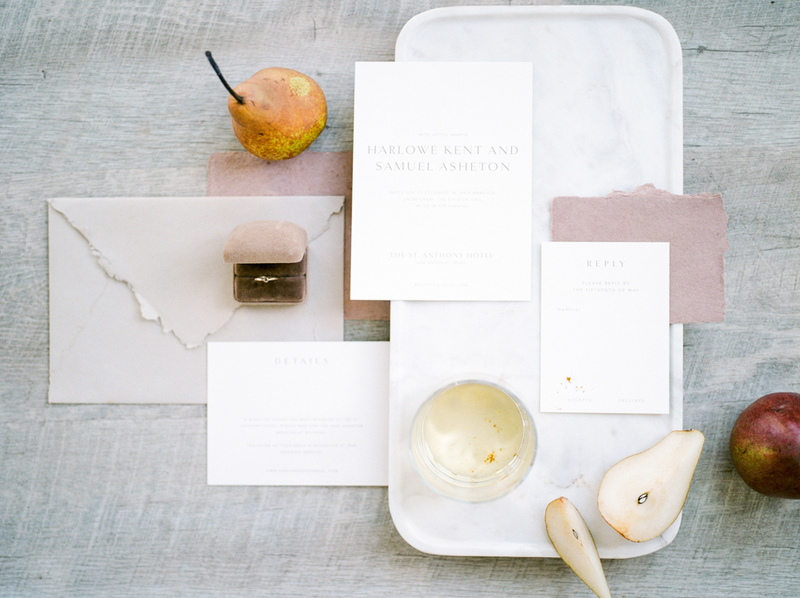 Along with the florals, Lexi also styled this shoot, from the table scape to the invitation suite & paper goods. Her approach was simple and mismatched, with different elements at each place setting. The paper goods from Nicolette Selman of Lazywood Lane using some handmade paper from Pressed Paper went along perfectly with the rest of the shoot, using the same fresh elements that were on the mismatched place settings. This wedding inspiration bridal editorial went off without a hitch, and per usual, I absolutely cannot wait to get back out to Utah to photograph again!